Good Friday is in town and undoubtedly you spent some part of the day coffee lounging, the Berliner’s favourite R&R. Swedes call this caffeine-induced relaxation the ‘Fika’, but the truth is Berliners do macchiato musing in their own distinct way. 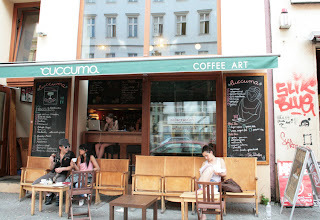 If you too like drinking tea or coffee then Berlin will not disappoint you. There are thousands of cafes, each serving not only your standard coffee range from cappuccino to espresso, but also chai lattes, bubble tea, earth smoothies and stale home-made vegan cake. Kreuzberg has a mix of Turkish cafes serving sweets and cakes, and hippie-run ‘dispensaries’ selling everything from coffee beans to harder stupefiers. These cafes aren’t exactly Starbucks. For starters the staff aren’t malnourished and trained to parrot corporate smiles. The décor is distinctly more books and magazines than global marketing and the only photos of smiling Ethiopians you’ll find will be on-the-wall photo or art exhibitions. If you find a café that is exhibiting, you’ll know how to behave once you’ve read this. Such demitasse purveyors require a studied approach. You’ll probably walk off the street thirsting for a coffee only to think you’ve walked into someone’s living room. Don't panic. Unless you’ve sleep-crashed into your neighbour’s Wohnzimmer, you’re in the right place. Cafes are meant to look like a living room – a la Sallowiste. Art house film posters will undoubtedly feature. The toilets should have enough flyers to substitute toilet paper should another Wall be erected during opening hours. Anarchist literature should be readily available on dusty bookshelves. Always order something that has an Italian name. If you drink filter coffee, switch to a macchiato. Sprinkle your order with ‘ciao’ and ‘grazie’ to encourage the notion that you are Italian. Never go to a coffee shop without your Mac. A Smarthphone is a vital accessory. If you have one, find ways to be busy with it while simultaneously drinking, smoking and talking. Wear your sunglasses all the time, regardless how dark it is inside. Smoke American Spirit (NB: Can kill) and drink green tea wherever possible. Try and frequent coffee-stores decorated with ripped chairs, recycled tables and wooden boards advertising foods you’ve never heard of. Never forget your Sallowist credentials. Only order cappuccini from baristas who can sketch Picasso paintings with foam.